Whether you are a seasoned veteran or a newcomer to running, there is no shortage of possibilities when it comes to running in Glasgow. From marathon training to the annual 5km fun run, there's a race for every level. Scotland's biggest women-only 10k run takes place in Glasgow in May of each year with more than 12,000 runners taking part. There is entertainment provided all along the route to make the run a great moment of camaraderie and enjoyment, but there is still the assistance of pace makers to ensure that serious runners have the opportunity to beat their personal best. The Great Scottish Run in September every year is Scotland's largest mass participation sporting event, attracting over 23,000 walkers, joggers and runners. It is possible to run solo or as part of a team, raising invaluable funds for charitable causes. The run offers participants the choice of running a 10k or a half-marathon course. The annual 5km Fun Run is open to all participants over the age of 15 who want to keep fit, enjoy a great day out and perhaps help a good cause, too. There is also a Pasta Party Fun Run over a 2 mile route ahead of the Women's 10k race each year, with a plate of delicious pasta served up to participants who complete the run. If you are travelling to Glasgow to take part in a run, The Sandyford Hotel is in an excellent location. We are very central, between the West End and the City Centre of Glasgow and convenient to public transport. 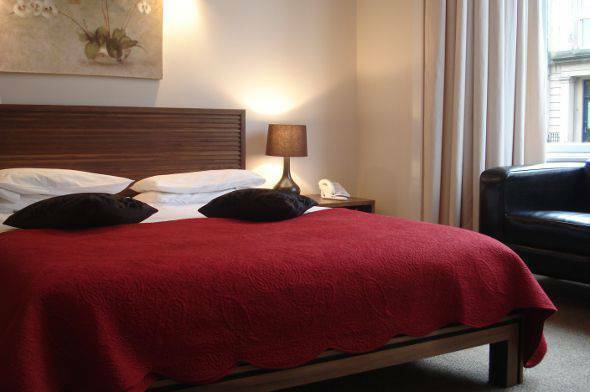 We offer 55 rooms furnished to a high standard of quality and 24 hour reception services. Our B&B prices are cheap, yet a full Scottish breakfast is part of the bed and breakfast accommodation at The Sandyford Hotel. Call us today on (+44) 0141 334 0000 to find out about available rooms when running in Glasgow. You can also contact us directly through the website with the help of the online booking form. Glasgow is a great place for running and The Sandyford Hotel is a great place to stay.